The Truth About The Cost of Running Your Commercial Dishwasher. A commercial dishwasher uses a lot of power and hot water to ensure the compliance standard of an 82 °C rinse. 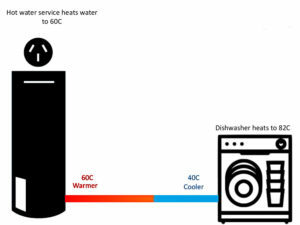 To achieve this quickly the dishwasher needs to be connected to a commercial hot water system to hit the required temperature. Once up and running the dishwasher call off around 2.5lt each cycle and has the potential to waste energy and hot water cooling in the delivery pipe. Think about it, the hot water system sits all day heating water at around 60 °C waiting for the dishwasher to call off a small amount each cycle. By the time it enters the dishwasher it could be around 40 °C. The dishwasher then has to re-heat the water to 82C to reach the compliant rinse temperature. Wasting energy & money! 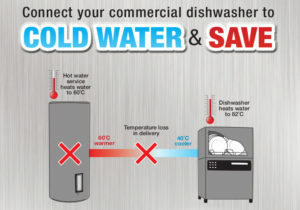 How much could you save if there was no need for a hot water system for the dishwasher? How much could you save by minimizing loss of temperature in the delivery? Cut costs with the Norris Fast Response System. It can work anywhere there is power, water & a drain. Ace Catering Equipment has been supplying premium quality and innovative commercial catering equipment for over 38 years. We offer clients a One Stop Shop, Turn Key Fittout Service and Equipment Supply.